Manado Gorontalo is Garuda Indonesia’s newest destination This represents a regional expansion for Indonesia’s premier airline. Garuda’s new Manado Gorontalo flight began on 6 January 2017. The flight leaves Manado’s Sam Ratulangi International Airport at 1530 hrs. Then it arrives in Gorontalo at 1605 hrs. The return flight leaves Gorontalo’s Jalaluddin Airport at 1645 hrs. Then it arrives in Manado at 1735 hrs. Moreover, flights are daily. The aircraft used is a Bombardier CRJ1000. This plane seats a maximum of 96 passengers. The flight provides economy seats only. As a result, there are no business class seats available. 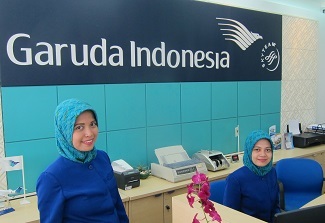 Garuda Indonesia has an office conveniently located in the business wing of Gorontalo Mall. Look for it on the south side of the mall. Garuda Indonesia provides 20 kilos of free baggage on its new Manado Gorontalo flight. In addition, divers can ask for an another 23 kilos of free baggage for sports equipment. Divers should do this upon check-in at the Garuda counter at the airport. Since the flight schedule is in the late afternoon, divers can enjoy three dives on the day prior to flying. The recommended dive-to-fly waiting period is 18 hours.